As one of the most complicated examples of hanging gardens, Weeping Rock is a striking place, with overhanging rocks dripping with water, feeding the ferns and flowers to maintain their intricate balance. 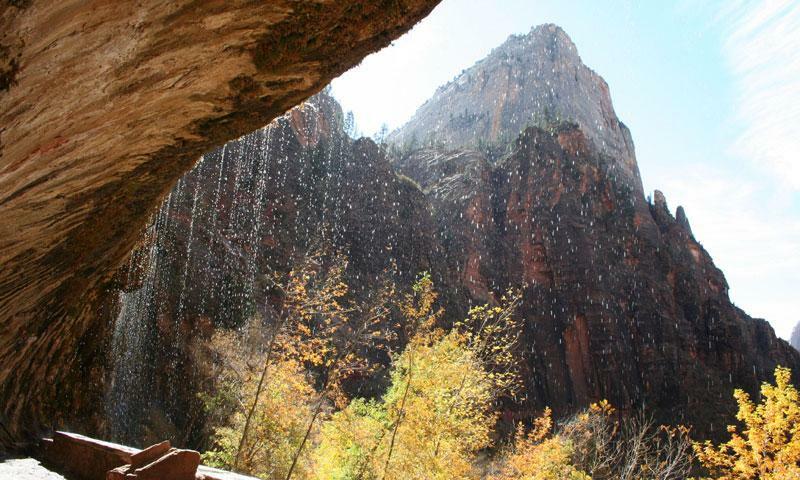 Weeping Rock is one of Zion's best and most-accessible hanging gardens. Well-shaded and cool from the dripping water, this is an easy hike for everyone! Try to identify the "window-blinds," "drip-lines," shooting stars, columbines and other flora. 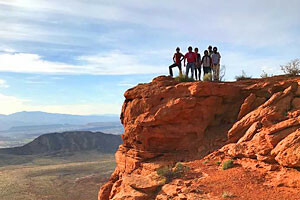 Ranger-led hikes are a great way to learn about the geology and plants of the area. Don't miss Weeping Rock, Zion National Park's amazing structure of hanging plants, waterfalls, drip lines, endemic species and more. Take a closer look at what's going on, you'll see the anatomy of a complicated structure that is also beautiful to the eye. A hallmark of Zion, Weeping Rock has water dripping off the cliff, following paths created by "drip-lines." These are the first plants to establish themselves. Shooting stars, columbines and others follow in the path, gaining root-holds in the eroded trails created by the drip-lines. Conveniently placed in Zion National Park, Weeping Rock is just off the main road, less than a half-mile round trip. 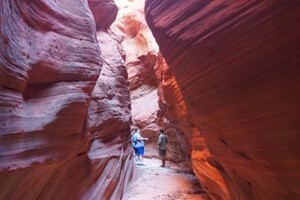 The paved path may be steep at places, but it is an easy one that is justified in being one of the most popular trails. The trailside exhibits help to explain different aspects of the flora around Weeping Rock, including the distinct flowers and ferns. The trailhead is a shuttle stop of its own, so just ask the driver to let you off there. It is the stop right before Angel's Landing. Bring along a camera and a plant guide, because the hanging gardens at Weeping Rock are both overwhelming and beautiful. Try to identify the window blinds, the columbines, ferns and drip-lines that make this micro-habitat unique. Like many place in Zion, Weeping Rock benefits from the knowledge of a ranger to explain the complexity of the garden, so make sure to check the event schedule to join a guided hike. Foster's Columbine, Aquilegia Fosteri, is a hanging flower endemic to Zion, meaning it can be found only within the park area. It can be seen at Weeping Rock, so ask a ranger to find one for you!